Everyone’s second favourite Sonic cat (Big being the first) joins Sonic Runners. Earlier today Blaze was added to the roulette wheel in Sonic Runners for a limited time. Sharing the character slot with Rouge, this gives players a 3% chance to get her. 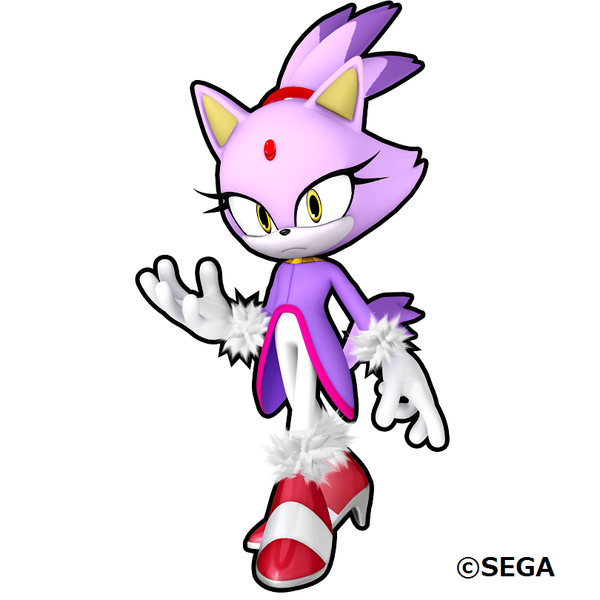 Oddly, Blaze is described by Runners as being a power type character, so she joins the likes of Knuckles, Omega and Big. Even stranger, she’s now a member of Team Rose. Blaze is available only for a limited time so if you want to get your hands on her you’d better act fast and be lucky, she’s only there until August 28th. Get all this all on the new trailer over on youtube. Blaze rocks and you know it. The Sonic the Hedgehog series has gone all over the place since games went 3D. Sonic Adventure sort of took the game away from its high-speed roots, though Sonic Heroes certainly delivered its own take on Sonic’s fast-moving antics. But still, there’s something to be said for the classics. Sonic Rush appears to be on that classic track, delivering the high-speed side-scrolling 2D that the early games in the series is known for. But by taking advantage of the Nintendo DS’s dual screens, Sonic Rush is definitely a new spin on an old favorite. Sonic Rush puts you in the roles of Sonic the Hedgehog and Blaze the Cat as they run real fast and attempt to recover the sol emeralds. Blaze isn’t playable in the short demo being shown at E3, but she’ll have her own separate adventure that, of course, often crosses paths with Sonic’s.